In this Malaysiakin report http://www.malaysiakini.com/news/94031 politically two things stand outs. One is when Muhyiddin was asked whether Zaids latest move could be seen as “PROVOKING UMNO” and the answer was ,”He is just a small guy,he is wasting our time. and UMNO will not be Provoked” Secondly,Taib who hit out at Anwar telling the PKR congress that he will unseat the BN Sarawak Government in the next elections. Unrest and Dayaks awakening if there was another political party may I say,what was supposedly a new name for Parti Rakyat Sarawak during the factional infighting- that is G.O.L.D. meaning Gegasan Organisasi Landasan Dayak or M.D.C. Malaysians Dayak Congress the chances are much brighter. This is not about racial based parties but the dayaks represent more than 60% percent of the total population of Sarawak. They are DISUNITED sorry to say BUT if there is UNITY you will know what will happen. But it also boils down to the Constituencies and the number of Voters breakdown. Lets repost this List and you will know what i mean. 3 months ago even a Dayak graduate was willing to sacrifice his years salary to the tune of nearly 50k in saying 29 dayak seats PKR will wrestle 26. I said lets have a small bet,”40K you lose 60K you win” Today he says I withdraw.WHY ask yourself WHY? Reality sets in and who is the Dayak leader that was most revered and he was none other than Tun Temonggong Jugah. Its not to incite the racial sentiments but Dayaks are holding Top government and Corporate sectors positions. MAS has Datuk Idris jala TNB has Moggie, State Secretary Datuk Wilson Baya just to name a few amongst the many dayaks in high positions in the civil service too. Marginalised I don’t think so! Enough written BUT lets take a more Perspective Rationale eventhough some times we are unhappy and want to VENT ALL our Frustrations. PKR has already dropped their BOMBS but BN will certainly know how to HIT BACK. Work your Seats then….. In 2006 Sarawak State Elections there was 54 Straight Fights,13 3-cornered,1 4-cornered,1 5-cornered and 2 YBS were returned unopposed. Malaysiakini has posted a lot of articles on this subject and pleas find below the relevant related sources. SARAWAK “PAKATAN” TAKEOVER or DESTROYED.!! In this Malaysiakini report http://www.malaysiakini.com/news/93995 this headlines “Top PKR leaders made it clear today that Sarawak is the party’s next target of a take-over to replace the Sarawak BN government led by long-serving Chief Minister Abdul Taib Mahmud.” Possible, of course if Rhetorics were to be Believed and can just CHANGE A GOVERNMENT..!! Has any one ever really felt the pulse and heartbeat of most Sarawakians..? This from an internet portal ( He also claimed that there were Sarawakian BN MPs who had already pledged their full support.”Sometimes, I get dizzy. Because they will sign their full support but the next day, he goes back to Kuching and attacks us. When I ask why? He says because they are suspicious of him,” Anwar explained. So your PKR team is making use of your new found FAME to wrestle Sarawak and to make it a frontline STATE. Even a Datin of a prominent businessman said,”In her wildest dream she cannot imagine you will be back in the limelight”. Now the tune is different is it Anwar..? Firstly get your symbol with the 7 coalition partners as per the societies act then we talk. PKR like Azmin Ali said was chased out being a Peninsular based party before. Any different today and then..? Nope!!! Anwar,Sarawakians are simple minded people but those WHO HAVE WALKED the CORRIDORS OF POWER are still disgruntled and frustrated and they feel that the BN government has not given them “enough or have just sidelined” them. THIS IS POLITICS FRIENDS and do not jeorpadise your Sarawak well being for the benefit of others. Pakatan or BN we leave it to the next elections BUT for now the immediate tasks is to ride the financial crisis that is happening in the world. Inflation has set in and its time to use our blessed economic hats or BRAINS to assist the country instead of too much politiking. Who cares who runs Sarawak BUT lets not run away from the facts infront of us. Your three meals have to be taken care of,childrens education,housing and car loans etc etc have to be paid to the banks or any loan institutions. These are HARD FACTS and dont DREAM of sitting on the POWERS OF THE THRONE when you cannot even help yourselves. PAKATAN or BN both will destroy you if you dont face realities..TRUTH PREVAILS………. 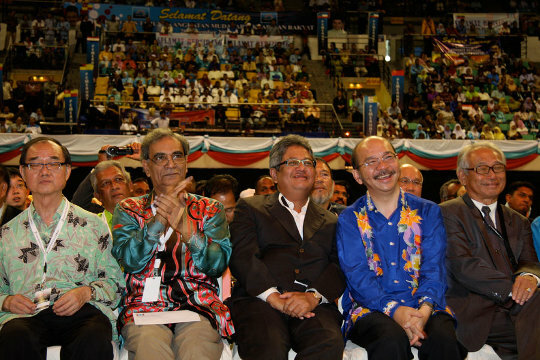 Malaysiakini has this report http://www.malaysiakini.com/news/93975 Former minister Zaid Ibrahim and Sabah Progressive Party (Sapp) president Yong Teck Lee made a special appearance at the opening ceremony of the PKR annual congress today. But the presence of Daniel Tajem will send more than signals all the way up to the BN Sarawak. He was together with Masir (MP for Sri Aman) during the March GE 12th nomination day and also assisting the BN candidate in securing the seat. Could James steadfastly solid stand behind the State BN turned Daniel to look at another vehicle..? I would not like to speculate but many political watchers has even predicted that if PRS stays within the BN family only James Masing will come out a winner. Out of 9 seats ,8 will fall to Pakatan. Really, but we have to be honest when we look back to the 1987 State elections aptly termed,”MING COURT SAGA”. The state assembly was dissolved then on 13th march 1987 and the election dates were 15th and 16th April 1987 for 48 seats only. Two significant changes 1987 the dayaks had PBDS. Today PKR which is a national multi racial party. 1987 there were 48 seats today there are 71 seats. How is this election different from the previous? NCR Land issues,BN arrogance etc etc but can Pakatan wrestle the state with the same disgruntled and frustrated politicians? Let’s just hope Tajem fields his son instead of himeslf again and thats what will be called a NEW DAWN. IT will be exhilarating for many and it will represent a CHANGE also from the OLD REGIME as Dr.Azizah (PKR President) puts it in reference to UMNO. With the PKR Congress in September 2009 heading towards the Land of Hornbill this in itself is a political statement to the Sarawak State BN. Zaid a former Minister even has this to say,””I am keeping my options open and will reveal it at the right time.” Meanwhile as quoted in Malaysiakini, Anwar said,”PKR with its partners in Pakatan Rakyat were determined to topple the Sarawak BN government. Do we need to say more..?? The “warcry” by “LIONESS”(fondly called by audie61) PKR president Dr Wan Azizah Wan Ismail in this Malaysiakini report http://www.malaysiakini.com/news/93977 where she spoke and hit hard at the transitional plan calling it,”no different than the old regime” Obviously she meant well, and that the country should have changes but one has to look inwardly too at the administration of Pakatan led states. She said,”We are here to stress that the transition plan between the prime minister and his deputy, Najib Abdul Razak will not make any positive changes to the damage that has been done to the judicial system, the police, the Anti-Corruption Agency and Parliament,”. Pakatan did well to deny the 2/3rds majority in the Parliamentary elections and kuddos to them. But we can deny that BN has the 140 while Pakatan has 81+1 independant. Say what you like,Pakatan group has to build for the future and not to be disheartened and cry over “WHAT COULD HAVE BEEN..?” THE SUN WILL STILL RISE IN THE EAST AND SETS IN THE WEST. PKR plus PAS,DAP are all national based party BUT what lies within LURKING are Sarawak based parties in PBB,SUPP,PRS and SPDP. The swing would be as we alll know that even during MING COURT 1987 PBDS + PERMAS cannot even topple BN 3 (PBB,SNAP and SUPP). What more can the LIONESS not know that WE DON”T. This extraced version from her speech posted in Malaysiakini. Wan Azizah today also vowed to pull off an “incredible performance” during Sarawak’s state election next year. She said PKR had thousands of new members, mostly from Sabah and Sarawak, a strong indication of winds of change sweeping the two states. If we were able to gain power in Sabah and Sarawak during the previous general election, we could have formed a new federal government by now. Insya’Allah this hope will materialise when the time comes,” said the 56-year-old politician.She added that PKR was currently in the midst of strengthening the party’s relationship with the two states to “ensure a more successful future” with them. “We are also committed to our promise – where 20 percent of petroleum and oil revenues in Sabah and Sarawak will be given back to the people.”We also promise to give more pro-active roles to these states at the federal level if we are chosen to lead the country one day,” stressed Wan Azizah. Seriously, letting of “steam or characteristically unpolitical” Is this really happening to PKR..? Is this the PLATFORM by the Sarawak PKR youth delegate..? Will this go down well with the PKR leaders who feels that consolidation,regroup,recharge are ways to push political statements through. This Malaysiakini report http://www.malaysiakini.com/news/93947 “Sarawak delegate Rahamat Aidil blasted national Youth leaders for ignoring the ‘eastern’ states. How will you feel if you are one of the leaders listening to these remarks. It’s obviously true but it should be more SUBTLETY DONE. Is this a calculated move by PKR sarawak to gain more support? The extracted version from Malaysiakini,”Political rhetoric about taking over more parts of Malaysia was useless unless there are concrete measures to strengthen PKR’s presence in all states, said Rahamat, when debating the address by PKR Youth chief Shamsul Iskandar Mohd Akin. Making it even more critical for Sarawak, said Rahamat, is the fact that the state will face an election in less than two years. Unless the momentum gained by the March 8 general election is carried through by investing time and resources in the Sarawak Youth wing, the national leaders will not be able to exploit the impact of the ‘political tsunami’, he added.He expressed disappointment that national Youth leaders had not even visited the Sarawak Youth wing. These words even pushed the envelope further down the table and will be exploited by PBB,SUPP,PRS,SPDP youth boys who will use it for political mileage. A political motivator said these words should never have been uttered,” “Do not look down on Sarawak. Is it because Sarawak is not as important as Peninsular Malaysia?” Rahamat asked. You make up your own mind and if PKR does not check the unnecessary political damage its not our fault. To us,”TRUTH DOES PREVAIL” but we do not want to be drawn into controversies. The Sarawak PKR youth boy does have a point and its up to the national body to pick it up and amke the necessary political accomodation. CRACKS APPEARING IN SARAWAK PKR…???? Natasha of audie61 was at the airport interviewing PKR first timer members who were making their way to the KL for the PKR National Congress. Some said ,’We just joined and we are fitting In” while others are “excited”. This Malaysiakini report http://www.malaysiakini.com/news/93873 has this,” Attention at this year’s congress, a non-election event to be attended by some 3,000 delegates and observers at Malawati Stadium in Shah Alam, is expected to be on Sarawak, the next target of Pakatan Rakyat’s planned takeover, as state assembly elections are scheduled in two years time. On another note Natasha said to another senior member,”Are you sure you will have Pakatan in Sarawak? It seems the issue of unfriendliness and the co-existence of DAP Chong and PKR Ng has been played over and over by the local tabloids. What about a Common Symbol like BN?” He said,”The top leadership will work something out between these two and they have to look at the BIGGER PICTURE of wrestling the State instead of LOOKING AFTER THEIR OWN EGO’s. As for the common symbol its a matter of time as,” The main obstacle towards registering PR as an official coalition is a legal requirement in the Societies Act, where seven parties are required to form a political coalition. Could SAPP and another Independant Opposition party like SNAP or STAR be enticed into these coalition? Maybe Parti Rakyat Sarawak or SPDP can also be considered he said with a cheeky smile as he made his way to the departure hall. Sarawak BN4 of PBB,SUPP,PRS and SPDP will be waiting for the opposition coalition and they will ensure that this strong BN Bastion will not be the next in line to fall. Work your strategies and your manifestos and let the people CHOOSE the 71 ADUNS. When this was posted on Malaysiakini special reports http://anwaribrahimblog.com/2008/11/26/anwar-will-not-set-a-new-deadline-for-power/ Anwar told reporters that he would not explain why the PR alliance has not yet taken power at this weekend’s PKR party congress.“There is nothing to explain. It will happen,” Anwar said in Parliament. He did not set another deadline. Yesterday we extracted the article from Stanley Koh http://www.malaysiakini.com/news/93722 which was “Perfecting PKR”. Today it seems that a NUCLEAR BOMB has just been dropped at the heart of PKR Supporters says a political watcher. More so, he said right at the heartland of Sarawak as the Pakatan supporters await the State elections in 900 days or thereabouts. Could this be just the perfect TIMING for CM or has Anwar just dangle the carrot..? Anwar has said this on November 15th 2008 at a dinner,”Sarawak, which has 30 members of parliament, holds the key to the Pakatan Rakyat (PR) government in the country.“When Sarawak changes its course, the Barisan Nasional government will collapse,” Seems that Anwar suddenly changed his own course while the Sarawak supporters are left to fend for themselves. Time to abandon PKR is it..? We have failed to form the Federal government is in everyones thoughts. Sarawak No Problems for BN. The rural NCR land issues e.g. http://www.malaysiakini.com/news/93782 and other urban issues can be solved. Grievances and unhappiness are made up by POLITICIANS who are disgruntled and frustrated. The people will still vote for BN and the “dacing symbol” Pakatan is irrelevant to Sarawak and it will not have any impact on Sarawak shores. Could Complacency come into the picture for BN? We have a close look at all the 71seats,the incumbents,the parties BUT we will leave the analysis to a later article. The voters represent the actual numbers during the 2006 Sarawak State Election. Why not make the necessary arrangements and if you are keen to contest you can choose any of the 71 seats. Remember it will be the NEW DUN BUILDING when you make your maiden speech.BE INSPIRED AND PUMP UP THE ADRENALIN.. In 2006 Sarawak State Elections there was 54 Straight Fights,13 3-cornered,1 4-cornered,1 5-cornered and 2 YBS were returned unopposed. Are you ready to serve when you are called upon? Be the Peoples Representative and if you are Prepared the People will have no Qualms to choose you. Is it that SIMPLE…? ?